Arizona had been on my list for a while and I finally got to go in November. Back in May, Jill and I attended a charity event on behalf of PACE and to keep ourselves entertained we participated in the silent auction. We ended up bidding against each other for 2 round trip Southwest Airline tickets. I soon realized that our husbands don’t actually have the vacation time to take another trip with us so I convinced her to take a vacation with me if we won. We ended up winning the tickets and booked a fall trip to Arizona. Jill is great to travel with because she lets me plan everything and only wants to see pictures of our destinations. Our itinerary included Antelope Canyon, Horseshoe Bend, Grand Canyon, and Sedona. We arrived into Phoenix close to 10 pm and were exhausted. Luckily, the car rental line was short. I had reserved an economy car but our customer service rep strongly recommended a 4x4 so we caved and went with his suggestion. Our hotel was a short drive away and we quickly checked in and went to bed. Around 2 am, someone tried to enter our room. Jill tried to wake me up but I was sound asleep and did not respond to her kicking. She is the responsible one and had put the latch on so our visitor was unable to get in. She got up and looked out the window and once the man saw her, he left. Apparently, the hotel staff did not check us in properly and they thought our room was unoccupied and gave it to another guest. Scary at first but it was fine in the end. We started our trip bright and early at 6am. Our plan was to be in Antelope Canyon for the 12 pm tour because we were told the sunlight is best at this time. We drove through the beautiful state of Arizona for 5 hours and saw huge cacti, gorgeous landscapes and Native American tribes along the way. The cacti outside of Phoenix blew me away because they were gigantic. I don't know why but we were an hour or so ahead of our Google maps arrival time. Not saying we didn't drive a little fast. The drive was also really easy because there were no cars on the road. We arrived at 11 and decided to join the 11:30 tour. It is really easy to miss the entrance so drive slowly on the main road. One thing we did not know was that all the tours led by Native Americans only accepted cash and we were short by about $20. The staff was so kind. They let us go on the tour without paying and told us to come back with the cash at some point during the day. One thing to remember: all Navajo sites require a guide whether you want one or not. 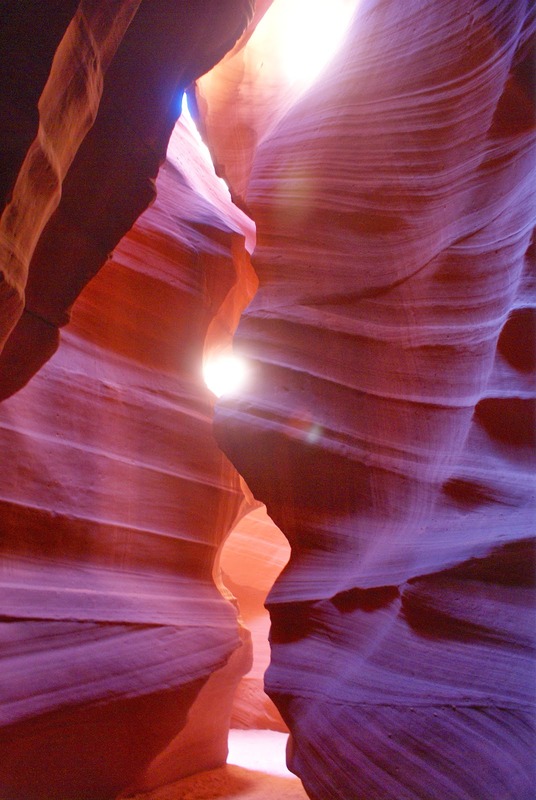 Antelope Canyon actually has two parts, upper and lower. We visited the upper canyon because online reviews said the lower canyon required climbing and we both did not want to risk anything with our bad backs. We got on a pickup truck with six other people from Switzerland, France and Thailand and headed into the canyon. We were blown away as soon as we entered. Everyone was oohing and aahing at the narrow passageways. We were 100-130 feet below the ground and it was amazing to look up and see the different shapes. Our guide explained the different formations and their spiritual relevance for the Native Americans. He also warned us about flash flooding in the area. Tourists have been stranded in the past because water comes in quickly and with great pressure. We were lucky to have the canyon to ourselves in the beginning of the tour and really enjoyed the personal stories of our guide. He helped us take beautiful pictures and showed us how water, sand and sunlight affect the canyon. We could not believe the shades of light at every angle and how quickly it all changes. Naturally, we took way too many photos. Once our hour was up, we headed into town to look for an ATM and found a Walmart instead. I bought some flaming hot cheetos and was able to get cash back. Snacking led to lunch. The restaurant of choice: Jack in the box. It was my first time and Jill said I had to have the experience. I felt guilty about eating fast food and opted for their healthy rice bowl. I regret the decision because I still don't know what their burgers taste like and there is no Jack in the box in Florida. I guess I will have to go back. Before heading back to pay our trusting guide, we made a quick detour for Horseshoe Bend. Horseshoe Bend overlooks one of the most spectacular views of the Colorado River. It is located just off of the local highway and again if you go too fast, you might miss the small sign. You have to walk on a dirt road for about 10-15 minutes to reach the sight. Under the desert sun, this can get intense but it is totally worth it once you reach your destination. Once we cleared our debt, we started our journey to the Grand Canyon. Our goal was to arrive by sunset. I don’t know why but, outside of Phoenix, we barely saw a car on the road. This led me to stop the car and take pictures on the road with the beautiful backdrop and it really made me feel like I was on a road trip! We arrived at the Grand Canyon about 30 minutes before sunset and got free admission in honor of Veterans Day. We entered from the east entrance of the South Rim and stopped at the visitor center before making our way to Lipon point to see the sun off. The canyon makes you feel so small because it looks like it goes on forever. The canyon was filled with colors from the sunset and it was amazing to see the shading change in a matter of minutes. 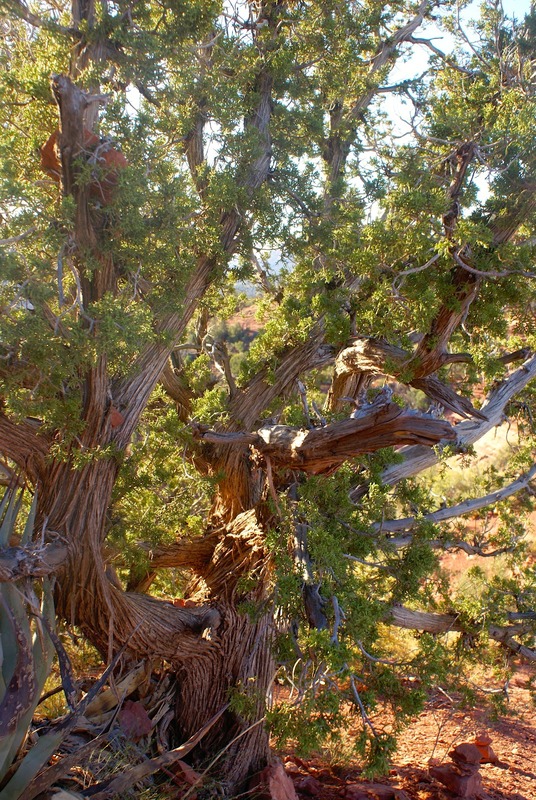 I had booked us a room in Grand Canyon Village at Bright Angel Lodge. It was about $200 a night but totally worth it if you want to take in the entire South Rim. Our room faced the canyon and was near the shuttle bus stop. It is probably cheaper to stay outside of the park but we didn't want to waste time traveling to and from the hotel. The village is a little community. There is a post office, bank, grocery stores and loads of restaurants. We enjoyed a low key dinner near the lodge and walked along the canyon under the stars before heading to bed. The shuttle bus system in the park is amazing and so user friendly. Park rangers told us the red route is best for sunrise and so we woke up at 5, bundled up and ran to catch the first shuttle. We decided to catch the sunrise at Hopi Point. I think for me sunrise was even prettier than sunset. Surprisingly, many other people woke up to see it as well. We decided to take advantage of the no car route and walked along the trail for an hour or so before catching the shuttle back to our lodge. This was a great idea because it felt like we had the park all to ourselves. After breakfast, we explored art galleries and souvenir shops before heading to the South Kaibab Trail for our hike to the Ooh Aah Point. Jill and I walked at a comfortable pace and took a lot of pictures of the great views. It was great to see the canyon from a different vantage point. Although it was a short trip, we loved the peaceful environment and want to come back to explore the North Rim. I have seen many pictures but the Grand Canyon is truly unbelievable in person and I don't think a picture can really capture its presence. Our next destination was Sedona and you guessed it...we made it there by sunset. The drive from Grand Canyon to Sedona is also very beautiful. Once you enter Oak Creek Canyon, you begin to see the red rocks all around you. There is something very calming about them. More on that later. I had booked us a room at the Sky Ranch Lodge. Once we checked in, we realized we had our very own deck with views of the red rocks and our hotel also had a private terrace with great views. It was perfect. I can’t even begin to explain the colors we saw as the sun as was leaving. We couldn't have been any happier with our trip and everything we had witnessed thus far. To celebrate, we decided to treat ourselves to a delicious dinner at Dahl & Di Luca. The food was ridiculously good. And the service was exemplary. We decided to get our leftovers packed so we could enjoy them at breakfast. It was that good. We woke up for sunrise and, as an added bonus, we got to see the red rocks alongside hot air balloons. There was something very soothing about this. I think I was a little emotional because I knew I would be leaving the country in a week. Once the sun was up, we warmed up our food and enjoyed breakfast on our deck and took in the view. It never got old. We kept seeing signs about vortexes and decided to ask the hotel staff about them. Their first response to Jill was, “you know you can’t actually see it right?” They gave us a map of four of the more common vortexes. We decided to hike to the one closest to us, airport mesa. Vortexes are claimed to be spiritual locations with an energy flow that is perfect for meditation and healing. We didn't necessarily believe this but wanted to experience it nonetheless. When we got up to the top, we were blown away by the 360 view. It was beautiful no matter where we looked. We were in awe. I can’t speak for Jill but I thoroughly enjoyed the experience. It was so serene and really made me forget about everything else in the world. For those wondering about the energy force, we did see twisted tree branches and people claim these are caused by the energy flow. We wanted to see some up the formations up close so we drove to Red Rock Crossing for views of Cathedral Rock. Their park is great for a walk and a picnic. Afterwards, we drove around town and saw Bell Rock, Teapot, Camel Rock and many others. Before driving back to Phoenix, we really wanted to hike up Devil’s bridge. Our trip was going so smoothly and of course something had to go wrong. Once we checked out and got in the car, the car wouldn't start. We tried a few times and called the car rental company but kept getting their voicemail. Our hotel’s maintenance guy tried to jump start the car and wasn't successful either. Finally, after 45 minutes we decided to move the gear shifter around and voila the car started. We were nervous about driving the car but had no alternatives because the car rental company never called us back. An hour behind schedule, we still decided to pursue devil’s bridge but completely underestimated how much time it would require. First, you definitely need a 4x4 to get close to the start of the hike. Second, once you get to the start of the hike (which is 45 minutes on foot from from the entrance) it is another hour from there. We were nervous about missing our flight so we hitched a ride back to our car and headed to the airport. 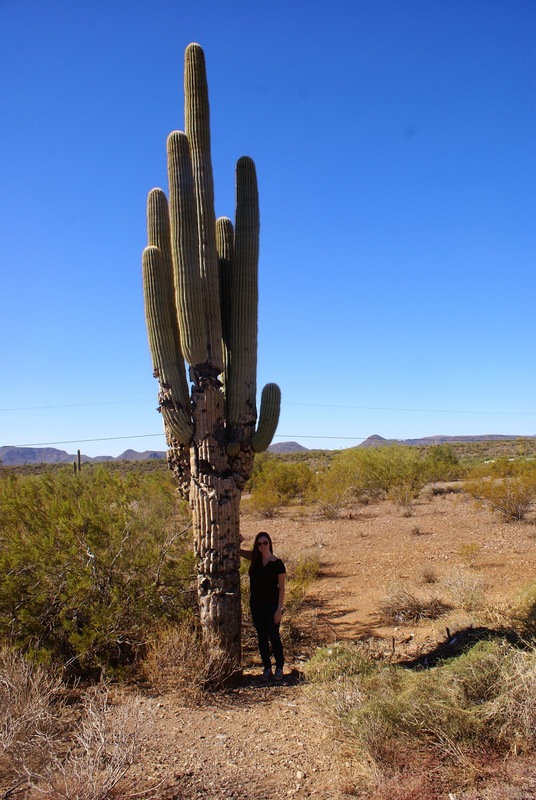 On the way back, Jill convinced me to stop on the highway by the giant cacti and take pictures. Initially, I was nervous about time but decided to give in and I’m glad I did because I really didn't grasp their size until I was next to one. We made it back to the airport with time to spare and were celebrating our great trip when then we got another blow. Southwest wouldn't let us use our tickets because they had apparently expired. We argued and asked for a manager and won in the end but the manager came to our assistance about an hour too late. Our flight left and our best option was to spend the night in Nashville on our own dime. We were disappointed about missing our flight and upset because we could have used the day to hike up Devil’s bridge instead of wasting time in the airport and in Nashville. There was a shuttle waiting for us in Nashville and I was really baffled by the name of the company. I won’t say anything else but include the picture for you. We arrived back in Jacksonville safe and sound. I really enjoyed exploring Arizona and want to go back out west to visit New Mexico, Montana and Utah. Prior to 2013, I really undervalued America as a travel destination because I did not realize how much there is to see. After visiting five new states and two national parks this year, I have come to realize that America is absolutely beautiful. no jack in a box? and yes. America is surprisingly beautiful - think we should appreciate the different topographies a lot more here, there is TONS to see. My aunt and uncle from SC just did a very long roadtrip and accomplished their goal for reaching all 48 continental US states, they said it was such a fascinating experience and a great time. I'll have to remember that for the life version of the bucket list. I'm at 26 states. Still have a long way to go but I am going to try to visit 2 new states a year. Baffled because I have seen the movie.That's impressive Nam. Did you go on a road trip? A number of them during highschool. Couple of summers spent in a van with bunch of fellow students, traveled/participated in Festival of India (see link below).